Atlas Quest: Return to Stone Mountain! At the time, the whole state of Georgia boasted of a single letterbox on LbNA, and even then it was a hybrid with a store-bought stamp. So I left a couple of crumbs in my wake. Pure letterboxes, with a hand-carved stamp. Rather crappy stamps, I might add, since I was new to letterboxing myself and not especially skilled in the art of carving. And one of those stamps I left at Stone Mountain. 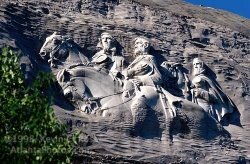 I called it the Stone Mountain letterbox because, well, it was at Stone Mountain and it was the only letterbox there so there wouldn't be any confusion about where the box was or which box it was. Just over five years later, I returned to Stone Mountain and wow have things changed! Red's Bunch held a gathering there--I think it's the third or fourth year it's been held there. At last count, something like 90 letterboxes are planted in the park. And not only do the powers-that-be in the park know about the letterboxes, but they actually encourage them! We got into Atlanta the evening before the gathering, August 4th, and checked into our hotel a few miles outside of the park. Originally we planned to meet with TurtleMcQ, the only other person who knew ahead of time we were coming since she has an adorable little girl who told us at the Ithaca gathering a couple of months before she wanted us there for her birthday. (Which was on the 4th.) How can you say no to that? We didn't meet up with Turtle that evening, though not for lack of trying! We called her and she informed us of a drenching downpour and a lightning storm the likes of which she hasn't seen in a long, long time. That wouldn't keep us away, and just as we were getting into the car to drive into the village of Stone Mountain to meet up, she called us back to say the power went out and perhaps Amanda and I should reconsider meeting up for dinner there. Instead, we stayed in the hotel and watched the lightning show out the window and a terrible wind blowing leaves and debris across the parking lot. Lots of fun! The weather the night before was indeed bad--much worse than I thought, in fact! Many of the park's attractions were closed (a pity for Turtle's kids--no waterslides!) due to cleanup efforts and some brave letterboxers *coughMoonBunnycough* who decided to camp at the campground that night were not allowed back! Can you imagine that? Setting up camp, leaving for dinner or whatever reason you left, and not being allowed to come back later that night?! The backroad around the campground was still closed when we arrived due to fallen trees. We also learned that the local news had incorrectly reported that the entire park was closed due to storm damage, and we wondered if that would cause some letterboxers not to show up. We didn't stick around the gathering long, though. It was already quite warm and humid, and we wanted to get some boxing out of the way before the temperature climbed any further! The day before, we passed one of those bank marquees that showed the temperature was 105 degrees! It was brutal! T-Rex got us started with a couple of nearby boxes, then Turtle and I went off to hike around the Great Mountain. Amanda decided to stay behind for some easier drive-by boxes while Turtle and I battled the trails. We did a pretty lousy job of finding boxes, to tell you the truth. We stopped briefly to consider Mark's 14th (or something like that--I'm doing this from memory so exact names could be incorrect) but decided not to when we weren't entirely sure which dry stream we were supposed to go up. Too dang hot to waste time possibly going in the wrong direction. We did find Amanda's Duck Duck box--the most found letterbox in the world according to Atlas Quest find reports with 51 reported finds now. We knew of other boxes along the Walk-In trail it intersected, but we weren't sure whether the boxes were up or down the trail from where we intersected it so decided to bag finding those for another day. As we approached my own box, we got a call from Amanda about one of my old friends from college days was hanging out at the gathering wondering where I was. =) I talked to her earlier in the morning and said I'd be hiking around the mountain, and I'd give her a call when we were done. I hadn't seen her in years, but that was before my letterboxing days and she's (*gasp! *) not a letterboxer. She knows what it is, of course--everyone who knows me knows what letterboxing is--but not everyone who knows me is a true letterboxer. I felt bad about leaving her to fend for herself among a bunch of letterboxers she didn't know, so Amanda picked us up at a road crossing and whisked us back to the gathering. But back to the true letterboxers.... Many more people had arrived by this time, and twice people had to stop me from stamping into my own logbook in the stamping frenzy. It was great finally being able to meet so many of these people I'd exchanged messages with over the years and whose posts I'd read: Eidolon, Beachcomber, StarSaels, 123Family, drgdlg, among others. I was especially happy to catch up with Mark since he's the fellow to gave me the ride to the Approach Trail and started me off on my 2,172.6 mile hike to Maine. Even if he did drive me there while having a suspended license. ;o) He showed up to the gathering fashionably late after not getting any sleep the night before, so I didn't get to talk with him as much as I'd have liked, though. =( It'll just give me an excuse to visit again some other time. Eventually, the gathering came to a close. Amanda, Turtle, and I met up with the rest of Turtle's family (two kids, a husband, and the in-laws) for dinner and desert before going back to Stone Mountain for the grand finale: The laser lightshow and fireworks. I've wanted to see this ever since I first heard about it, but could never managed to pull it off. This time, I pulled it off. It's cheesy, but I love cheese, and I loved the show. I kept my eyes open for other letterboxes who also wanted to watch the show, but I didn't find anyone I recognize. Admittedly, he fact that there must have been two thousand other people watching the show and it was dark out didn't help. All-in-all, it was a terrific little gathering. I really expected a lot more people to show up, but it was perfect! Well, except for the heat and humidity. Minus that, it was perfect! =) Rain, lightning, and storm damage are fun, but us west-coast people really don't like that heat and humidity. We're wimps! Wow! What a great carving! 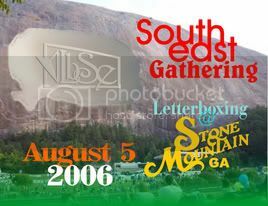 I've never been to Stone Mountain, and now I want to go for the next gathering! Are they every year? Sounds like a good trip...gonna have to drag the Highlander down there someday! Ryan said: "At the time, the whole state of Georgia boasted of a single letterbox on LbNA, and even then it was a hybrid with a store-bought stamp." Eidolon said: And that hybrid box is still in Atlanta, with a store bought stamp. Also, yes Music Woman, that is the third annual SE gathering at the 'Big Rock' so keep your eyes open next summer. After three years of working around the school's summer breaks and braving the Atlanta heat, I'm thinking we may plan for an earlier (and cooler) date in 2007... maybe April or May! I was told several times at this year's event that we would likely get more of the "gathering hoppers" from the north to show up if it weren't held during the hottest part of summer. Glad you got to see the cheesy laser show, since we didn't have any cheese-racing at the gathering. Thanks for the plug, Ryan! To Find or Not To Find--that is NOT the question!